Astro-Climate-Connection: A Case of Severe Cognitive Dissonance? Astronomers almost by definition are geometrically gifted. Thinking about objects and processes in three-dimensional space is a big part of what they do. The large majority of Climate scientist, in my opinion, have been shown to be one dimensional. Shown a graph of CO2 and Temperature both increasing they immediately conclude that must be the cause of global warming. They are not perturbed by your work because they can’t understand it, especially when described by terms like, Perigean, line of apse, declination, solstice, etc. They ignore it and work with their simple alternative facts. Visualizing the moon moving up and down threw the celestial equator, while also moving in its orbit that is slowly rotating about the earth and interacting with the oceans on an earth which is itself tilted and moving in its orbit around the sun is not easy. I’m not an astronomer and it hurts my head to do it. I think you are correct in your discovery and analysis, but it will take a large effort at visual simplification to get understanding by the Climate crowd. In addition, for a number of political and personal reasons your ideas will be strongly resisted by many so called scientist as it threatens policy and careers. I am not hopeful if it can be done. Of course, in the face of your predictions working and theirs not working or they can’t even make predictions, that would be definitive and something that can not be ignored. And it has always been the cornerstone of scientific advance. Thank you for your well considered comments. As you say, time will tell whose predictions/models are correct! Ninderthana, you are very brave making firm predictions for ENSO events over the next few years, and I wish you success. I note your success on predicting recent ENSO events in the past. I think the AGW movement is so sure ENSO events are somehow connected to carbon dioxide-driven global warming that they refuse to consider any other explanation. In the meanwhile please can I ask you to extend your diagram to 2020 with existing and predicted ENSO events shown. It ends at 1998! It will still be within your Epoch 6. I think publishing this extended graph can only help your case. Thank you for you great comments! Sorry for my delayed comments as I have been away for a few days. It took me two weeks of intense work to prepare the diagram shown in this plot, so it will take a little time to do the most recent 31-year Full moon epoch from 1994 to 2025. 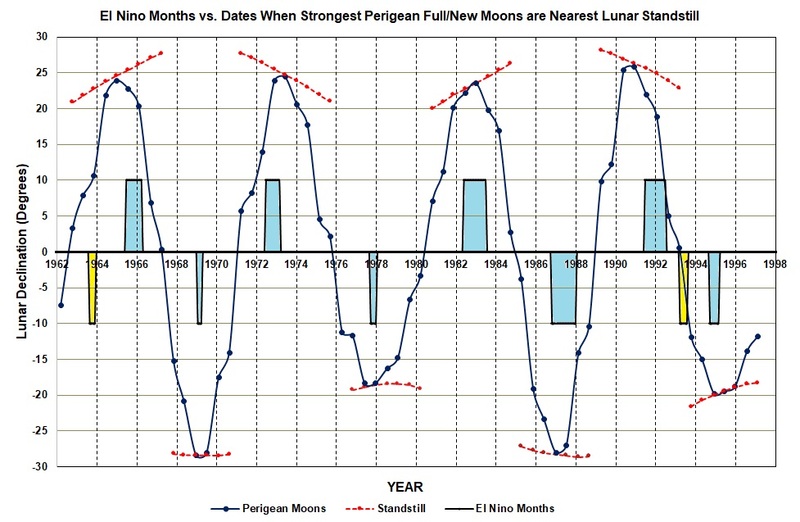 During Full moon epochs, most moderate to strong El Nino events occur when the strongest Perigean New/Full moons are crossing the Equator - This is the same a saying that they occur at times when the line-of-apse of the lunar orbit is pointing at the the Sun at the Equinoxes. This rule is obeyed by all (i.e. 1997/98, 2002/03, 2006/7, 2015/16 but one (i.e. 2009/10) of the moderate to strong El Nino events during this time period. Does your system show an el nino forming this year - 2018, or in the next year or two? Hind casting is usually easier than prediction. Regards acceptance, science has taken a turn towards accepting anything new, it seems as a given - accept if it contradicts something they have already accepted. There is a hard wall to break down to get traditional science to accept change of any sort of its chosen beliefs. Not sure what name and URL means here as most sites ask for name and a non-visible email address.